At the Select backup location step of the wizard, specify where the backup file that you want to use for data recovery is located. To recover data from backup, you need to mount the backup storage on which the backup file resides to the recovery image OS file system. Veeam Agent for Linux automatically mounts external USB drives that are connected to the computer and displays them in the list of available backup locations. You can select the necessary device and press Enter to pass to the Browse for backup files step of the wizard. Add shared folder — select this option if the backup file is located in a network shared folder. With this option selected, you will pass to the Mount shared folder step of the wizard. Mount local disk — select this option if the backup file resides on the local computer drive, external drive or removable storage device that is currently connected to your computer. With this option selected, you will pass to the Select local disk step of the wizard. 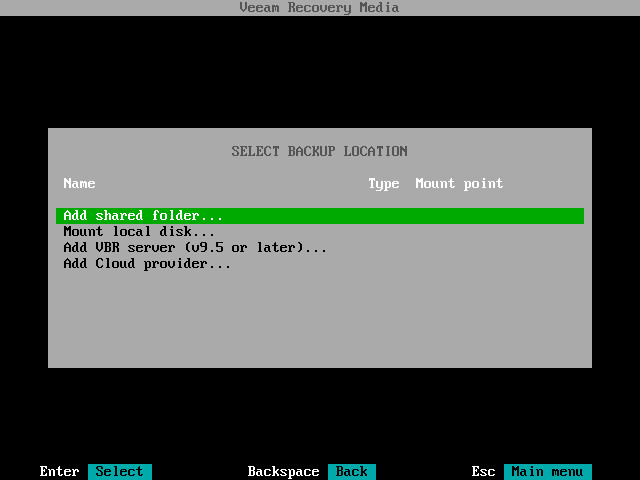 Add VBR server — select this option if the backup file resides on a backup repository managed by the Veeam backup server. With this option selected, you will pass to the Specify backup server parameters step of the wizard. Add Cloud provider — select this option if the backup file resides on a cloud repository exposed to you by a Veeam Cloud Connect service provider. With this option selected, you will pass to the Specify Cloud provider parameters step of the wizard.